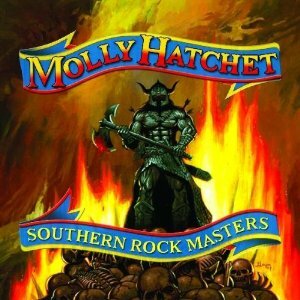 The southern rock band, Molly Hatchet, has been going strong for more than three decades. 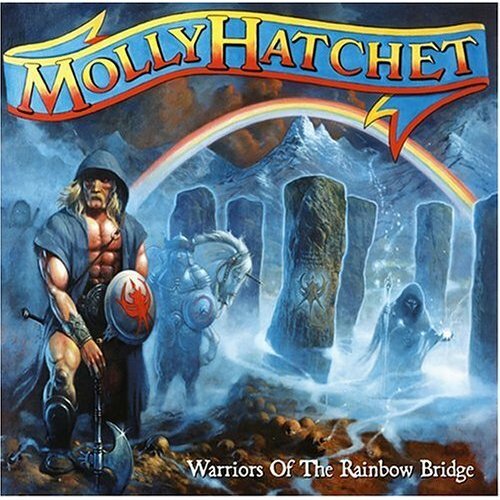 During that time the band has undergone major changes in its lineup, but one thing, besides the music, that has remained nearly constant is the use of the heroic warrior on the Molly Hatchet album covers. 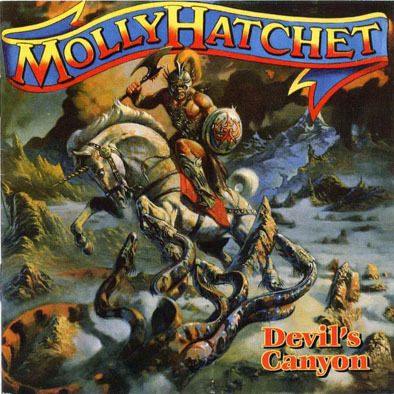 The fantasy art on Molly Hatchet record albums has been consistently some of the best cover art in rock and roll history. 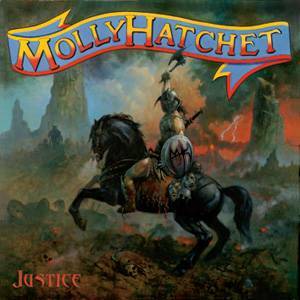 The band, originally from Jacksonville, Florida, released its debut album, “Molly Hatchet” in 1978. This was the first album to display the famous warrior art that is now associated with the band’s hard driving rock image and the album found a huge fan base, ultimately going platinum. This strikingly dark warrior on a massive stead was the creation of famous, fantasy artist Frank Frazetta. His art work would also appear on Molly Hatchet’s next two albums, “Flirtin’ With Disaster” (1979) and “Beatin’ the Odds” (1980). 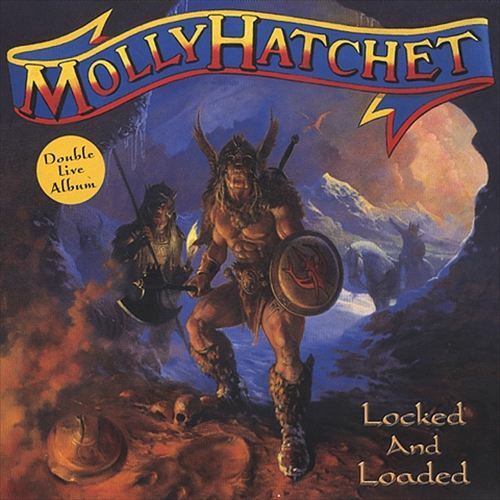 The multiplatinum album, “Flirtin’ with Disaster”, and the song of the same name, were Molly Hatchet’s best received work to date. “Beatin’ the Odds” also went platinum although less popular than Molly Hatchet’s second album. 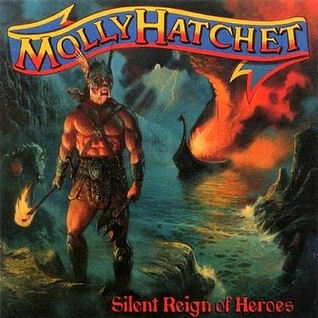 Molly Hatchet’s fourth studio album, “Take No Prisoners” features the members of the band on the album cover in a fantasy art painting by Peruvian artist Boris Vallejo. Frank Frazetta, the artist who created the three previous album covers, was replaced by Boris Vallejo, reportedly because Frazetta tripled the price he demanded for his album cover work. The Take No Prisoners album was less successful than any of the three previous albums. 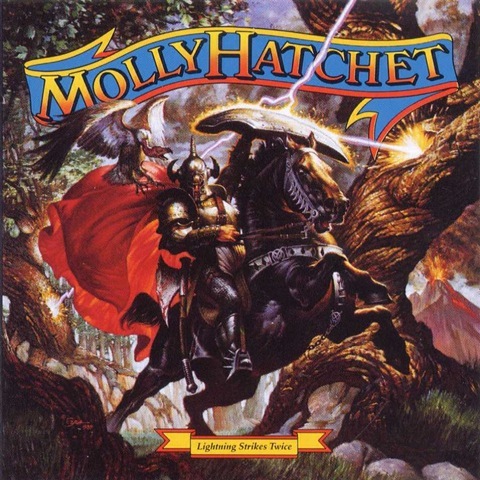 Molly Hatchet’s fifth studio album, “No Guts No Glory” is the only studio album where Molly Hatchet deviated from the fantasy warrior theme on the album cover, in this case in favor of a western-cowboy theme. 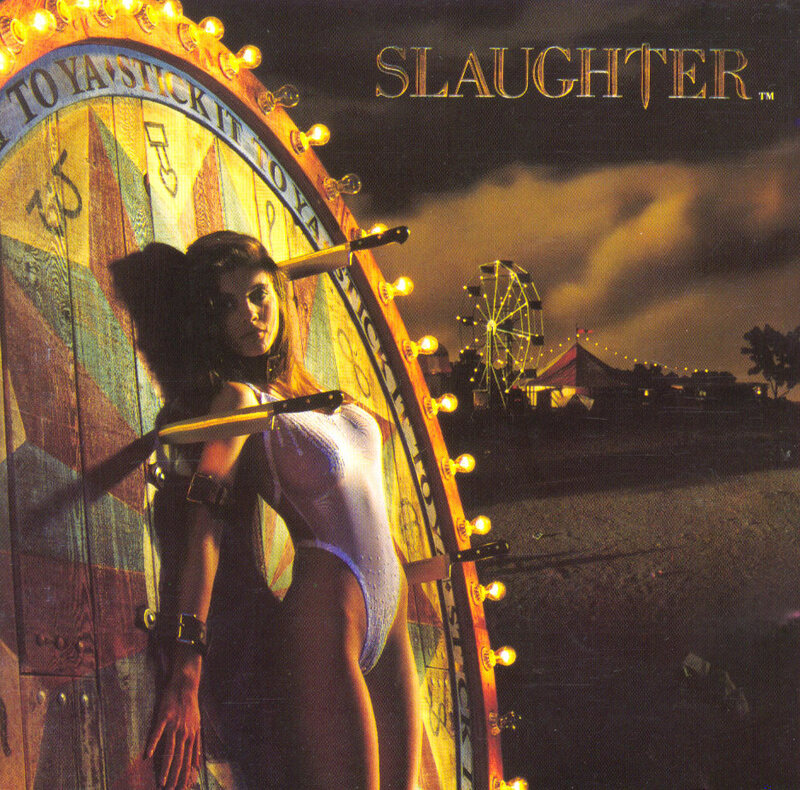 The photo used on the “No Guts No Glory” album cover was taken by Bob Seidemann and was reportedly shot at Six Gun Territory, a western theme park, near Ocala, Florida. 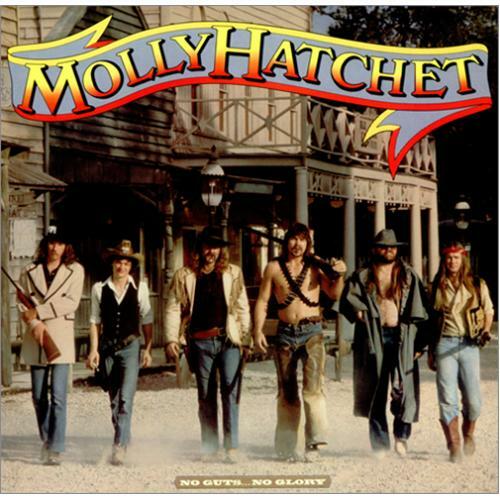 Released in 1983, “No Guts No Glory” was not a commercial success, but it is generally considered a favorite among Molly Hatchet fans, as it marked the return of lead singer Danny Joe Brown, and is therefore more similar to Molly Hatchet’s first two albums. 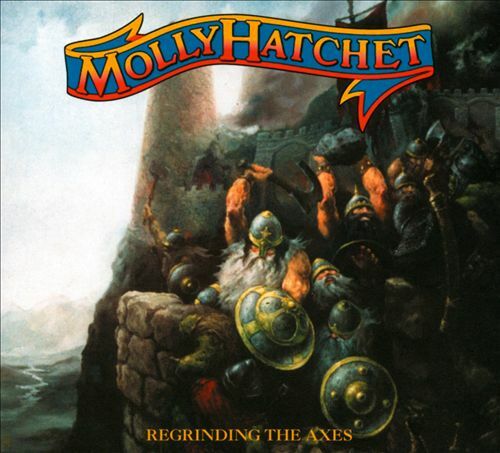 “The Deed is Done” was Molly Hatchet’s sixth studio album released in 1984. Although aiming for a broader listener base with a more commercial, FM-friendly, hard rock sound, this album failed to excite the mass market. 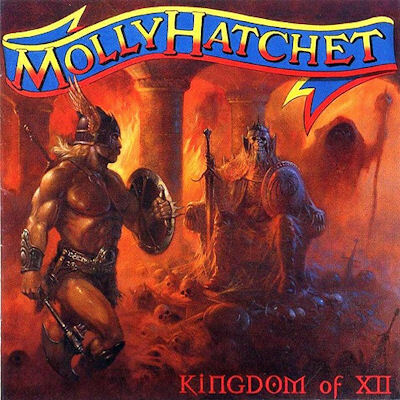 This album was the first Molly Hatchet album without cofounder Steve Holland who had had enough of the band. 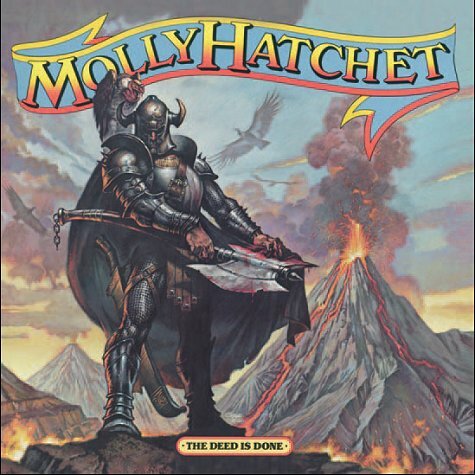 Molly Hatchet returned to its fantasy warrior theme on “The Deed is Done” album cover using the art work of Ezra Tucker. Ezra Tucker is an internationally renowned commercial artist/illustrator whose clients include Scholastic Books, Boys’ Life Magazine, Arizona Highways Magazine, the National Park Service, the National Forestry Service, Universal Studios, Walt Disney, Anheuser-Busch, Coors Brewing Company, Seagrams, Carnation, Kelly Tires, Brunswick, and MGM Grand Hotel. Tucker graduated from the Memphis Academy of Arts earning a BFA Degree in Advertising Design. Tucker describes his style as “Nouveau Victorian Realism” where animals, people and landscapes are realistically depicted in fantastic settings. This style is reminiscent of the Victorian period painters. Ezra Tucker is recognized for his mastery of detail and has won numberous awards. His work is included in museum, private, and Fortune 500 corporate collections. Although Ezra Tucker is remarkably versatile in the type of works he has done, his true passion is for painting wildlife. 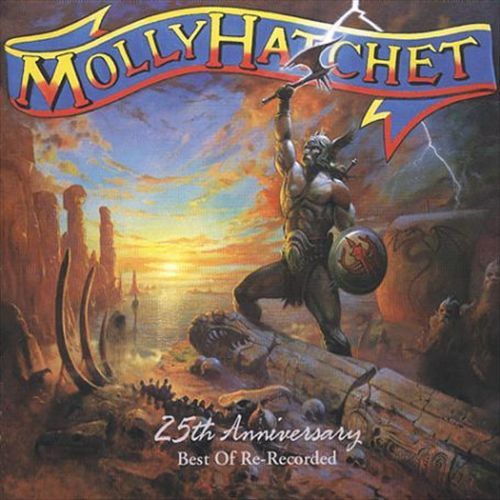 Molly Hatchet’s seventh studio album, “Lighting Strikes Twice” was released in 1989 and also features the art work of Ezra Tucker. This was the first album without Molly Hatchet’s other cofounder Dave Hlubek, who left the band due to his struggle with drug addiction. Hlubek was replaced with guitarist, Bobby Ingram. A Grammy award winning album, and considered by many to be one of the top 100 albums of all time, Born in The USA had seven of its twelve songs reach the top ten. This was Bruce Springsteen’s seventh studio album and it achieved both critical and commercial success. This iconic album cover was photographed by famed photographer Annie Leibovitz. The simplicity of the cover, which shows only a rear view of Bruce Springsteen in blue jeans standing in front of an American flag, is in sharp contrast to the strong symbolic and political message of the image. Bruce Springsteen has always portrait himself to be a working class, patriotic American and the album cover and title further support this picture. 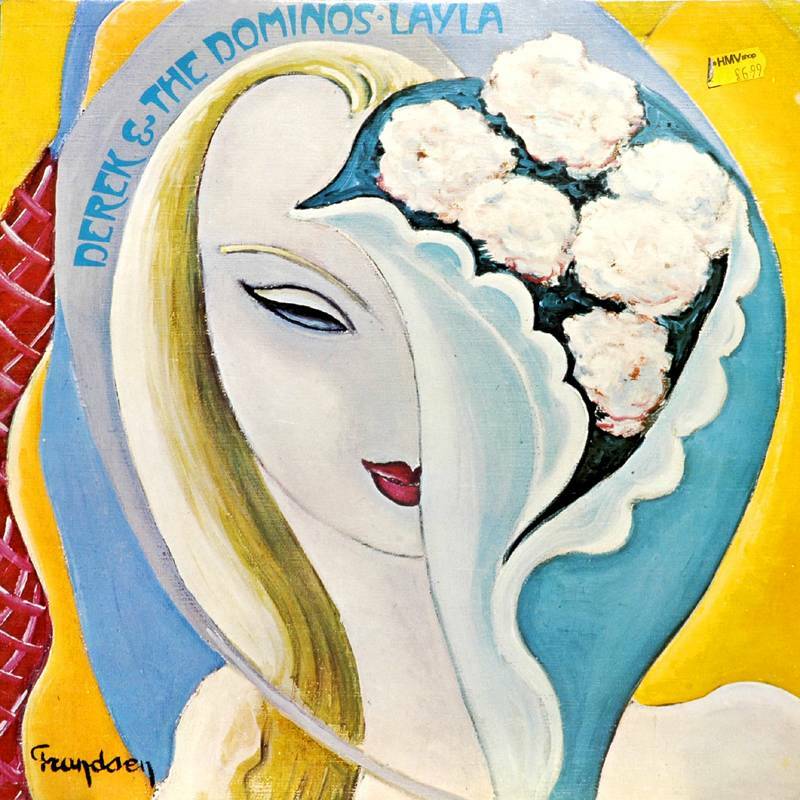 The only studio album by Derek and the Dominos (aka: Eric Clapton, Bobby Whitlock, Carl Radle, Duane Allman and Jim Gordon) Layla and Other Assorted Love Songs is mainly a collection of unrequited love songs. Regarded by many as Eric Clapton’s greatest work, this double album contains such classic rock songs as Layla, Bell Bottom Blues, Little Wing, Why Does Love Got to Be So Sad, and I Looked Away. The album was recorded and released in 1970. Clapton met Bobby Whitlock, Carl Radle, and Jim Gordon while playing with Delaney and Bonnie and Friends and then they later played together on George Harrison’s triple album, All Things Must Pass. Duane Allman later joined the Derek and the Dominos recording sessions after Eric Clapton showed up at an Allman Brothers concert and invited Duane to jam with him after the show. The album cover is a painting by French artist, Frandsen De Schonberg. The painter was the father of a friend whose house the band had stayed in when playing in France. Clapton chose this particular painting for the album cover because it reminded him of Pattie Boyd-Harrison, the inspiration for the title song. Eric Clapton had fallen madly in love with friend George Harrison’s wife and her rejection is at least partially credited with pushing Clapton into his heroin addiction. Ironically, the couple married in 1979, but Pattie divorced Clapton in 1988 as a result of his heroin addiction and alcoholism. Led Zeppelin is one of the greatest rock and roll bands of all time. The band has been a major influence on rock and roll since its beginning in the late 1960’s. During the seventies, Led Zeppelin dominated rock and roll, but disbanded in 1980 after the death of drummer, John Bonham. 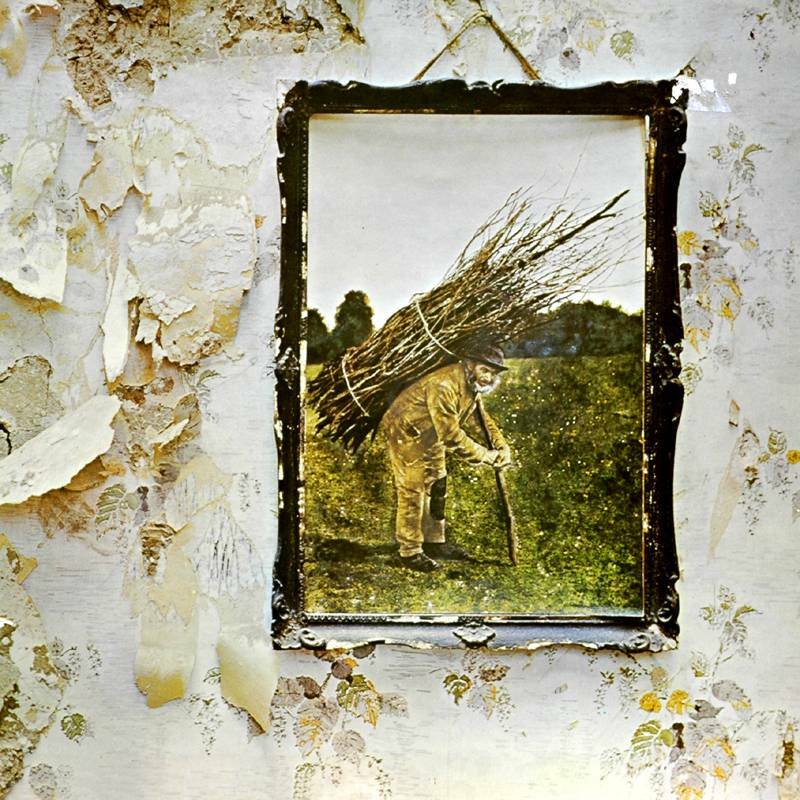 Arguably Led Zeppelin’s greatest album was Led Zeppelin IV, with hits like “Stairway to Heaven” and “Black Dog”, this album found both commercial and critical success. The album still ranks with the best selling albums of all time and can be found on almost any greatest albums of all times list. The cover of the album shows a black-framed picture of an elderly man carrying a bundle of branches on his back which is hanging from a wall with floral wallpaper that is peeling off. In itself the imagery on this cover does not appear that significant; however, the lack of any text added to the albums mystical appeal. According to Page in a 2010 interview with the Times, “The cover was supposed to be something that was for other people to savour rather than for me to actually spell everything out, which would make the whole thing rather disappointing on that level of your own personal adventure into the music.” With itsTolkien-esque lyrics and ancient symbols on the album’s inner sleeve, the cover served to amplify the mystic of the entire album causing fans to hunt for hidden meanings for years to come. Considered by many to be the ground-breaking concept album, Sgt Pepper’s Lonely Heart’s Club Band was released by the Beatles in June of 1967. The album’s concept originated with Paul McCartney, who was inspired by the Beach Boys’ 1966 release of Pet Sounds. Ironically, Brian Wilson had been motivated to write the songs on the Pet Sounds album after listening to the Beatles’, Rubber Soul album. Sgt Pepper was probably one of the earliest examples of a concept album. It’s this overall ‘multimedia’ approach, making the music, the lyrics and the concept art link together that makes this a stunning showcase of modern rock. For the first time on a Beatles’ record, the artwork, packing and every song were connected in some way. Ironically, although connected, the music on the album was influenced by such diverse genres as music hall, jazz, rock and roll, western classical, and traditional Indian music. One of the most important albums in modern music history, Sgt Pepper influenced many artists including Pink Floyd, Jimi Hendrix, and Oasis. Sgt. Pepper was a worldwide critical and commercial success, spending 27 weeks at the top of the UK Album Chart and 15 weeks at number one on the US Billboard 200. It consistently ranks at, or near, the top of most published lists of the greatest albums of all time. Sgt. Pepper is also one of the best selling albums of all times, with worldwide sales of 32 million copies. Nominated for seven Grammy Awards in 1968, the album won four, including Best Album of the Year and Best Album Cover. The Grammy-Award-winning album cover was designed by Peter Blake and, his wife and artistic partner, Jann Haworth; and photographed by Michael Cooper. 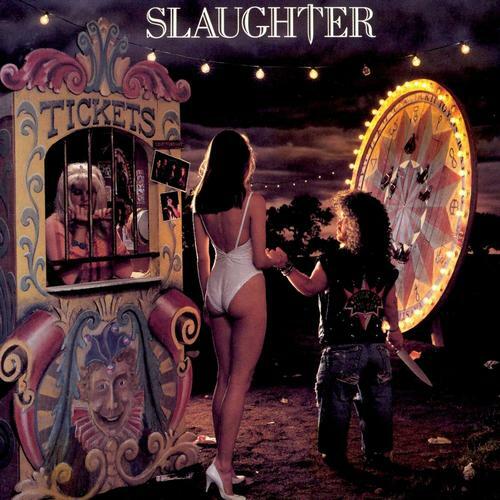 The front of the album cover shows the band posing in front of a collage of life-sized cardboard models of the band’s favorite celebrities. The Beatles, as the Sgt. Pepper Band, are dressed in custom-made military-style outfits made of satin dyed in day-glow colors. These suits were designed by Manuel Cuevas. The album’s lyrics were printed on the back cover, the first time this had been done on a British pop album. Although Peter Blake later complained about the amount of the fee that he received for the design (only£200, with no subsequent royalties); the total amount spent on creating the cover was nearly £3,000, about 100 times the average cost for an album cover in the 1960s. The Sgt. Pepper’s album cover has become an iconic work of pop art, much imitated and certainly Pete Blake’s best known work. This elaborate album cover art has spawned great interest and deep study. 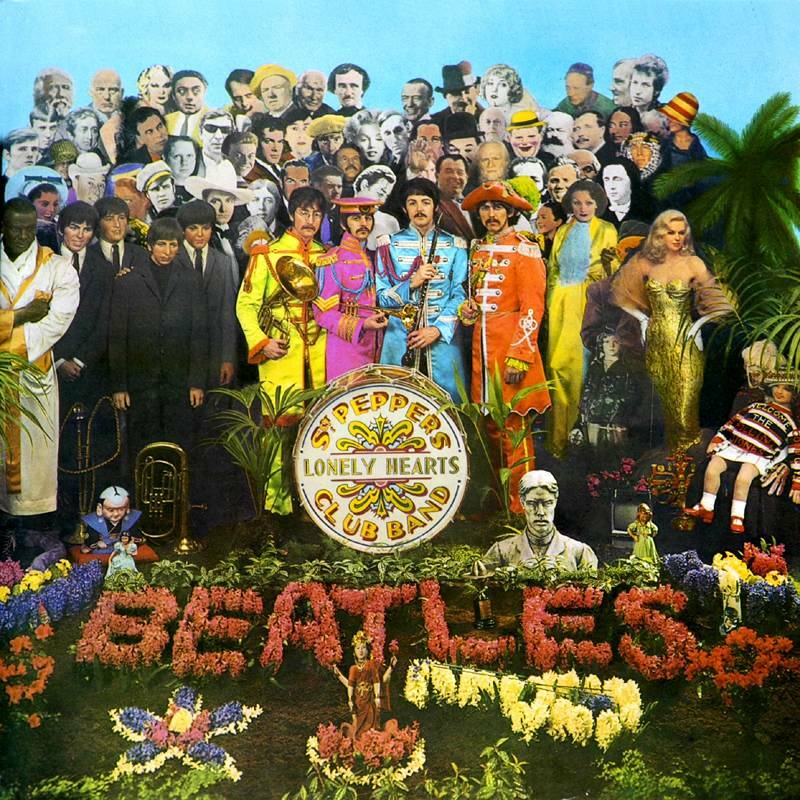 The album cover features more than 70 famous people, including writers, musicians, film stars, and (at Harrison’s request) a number of Indian gurus. The final grouping included Marlene Dietrich, Carl Gustav Jung, W.C. Fields, Diana Dors, James Dean, Bob Dylan, Issy Bonn, Marilyn Monroe, Aldous Huxley, Karlheinz Stockhausen, Sigmund Freud, Aleister Crowley, Edgar Allan Poe, Karl Marx, Oscar Wilde, William S. Burroughs, Marlon Brando, Stan Laurel and Oliver Hardy, and Lenny Bruce. Also included was the image of the original Beatles’ bassist, the late Stuart Sutcliffe and the wax figures of the current four Beatles. Adolf Hitler and Jesus Christ were requested by Lennon, but ultimately their images were left out.